Released on September 25th, 2013, Amazon Kindle Fire HDX tablets are rendered as a real threat to iPad with the attractive new screens and new features. Kindle Fire HD and Kindle Fire HDX share something in common. Both of them have a 7-inch screen. As a new generation of Kindle Fire tablets, What improvements has Amazon made to Kindle Fire HDX? Here we will give a thorough comparsion between the two tablets. The display of Kindle Fire HDX 7, in the words of Amazon, is a breakthrough HDX display. Kindle Fire HDX has a high resolution display (1920x1200) and pixel density (323 ppi) while Kindle Fire HD 7 features a new 1280x800 high definition LCD display. There is no doubt that Kindle Fire HDX will show you more vivid images and videos with reduced glare and improved brightness. For reading lovers, the improvement in weight is commendable as they might prefer a lighter e-reader for dedicated reading. Kindle Fire HDX is lighter than its previous generation which makes it more portable. Kindle Fire HDX is the first tablet equipped with the 2.2 GHz quad-core Snapdragon 800 processor.It means that the HDX could provide 3 times more performance the HD. Combing with 2GB RAM, you can get faster launch time and load time. Built atop Android 4.2.2, the new Fire OS 3.0 "Mojito" offers the same Android app compatibility as previous editions, but has hundreds of new features and low-level platform enhancements. The OS is exclusive (for now at least) to the new Fire HD and HDX models. Kindle Fire HDX adopts the latest Fire OS 3.0 with which we can freely switch among the recent apps and content. You don't need to go back to home screen to access other content. You may consider that a better HDX dispaly will compromise the battery life. The truth is that Kindle Fire HDX 7 boasts an 11-hour battery life, which up to 17 hours when you are just reading. When it comes to tech support, most comusers would think of sending email, calling the support line or searching for FAQs or official forums on website. And that is what Kindle Fire HD does. However, people have been relishing Mayday service since Kindle Fire HDX is released. Mayday is a near-instant personal customer service like we've never seen before which in available in Kindle Fire HDX tablets. When you tap the Mayday button on the shortcut menu and then tap Connect, a customer service representative will appear on your screen within 15 seconds. The rep can draw on the screen, take complete control of your tablet, or simply coach you through difficult times. Mayday is a 7/24/365 and free service. Amazon is making key improvements with Kindle Fire HDX. For people who use Amazon a lot for books, video and other services, the Kindle Fire HDX delivers incredible value for its price. Want to rip DVD to HD video files for Kindle Fire HDX? 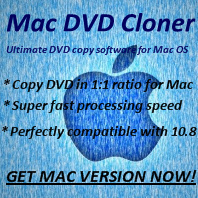 With Any DVD Cloner Platinum, you can make it easily!